I have a confession to make. Until recently, I’d never made a soufflé. Those miracles of egg and cheese and air and lightness always intimidated me. How stiff do the egg whites have to be? Will it they collapse in the oven? How the heck do you serve from that large soufflé dish? I decided it was time to address these important questions. Armed with some handy tips from a back issue of Cooks Illustrated, I boldly ventured into my first soufflé experiment – and it was a grand success. Baking the batter in small sized ramekins solved the most vexing problem, that of serving technique. The rest of the credit for this recipe’s success goes to the fabulous, farm-fresh duck eggs from Bearbrook Game Meats and the delicious Hillbilly Buffalo Milk Cheese from Canreg Station Farm & Pasture Dairy, both of which were in my wintertime Farmers’ Feast challenge basket from the Ottawa Farmers’ Market. 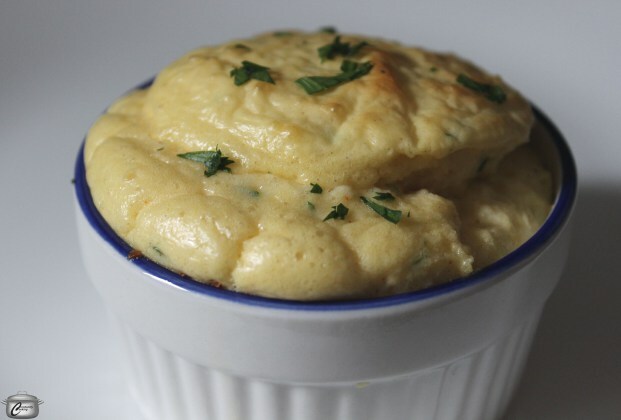 Paired with a green salad, these soufflés made for a very scrumptious lunch. 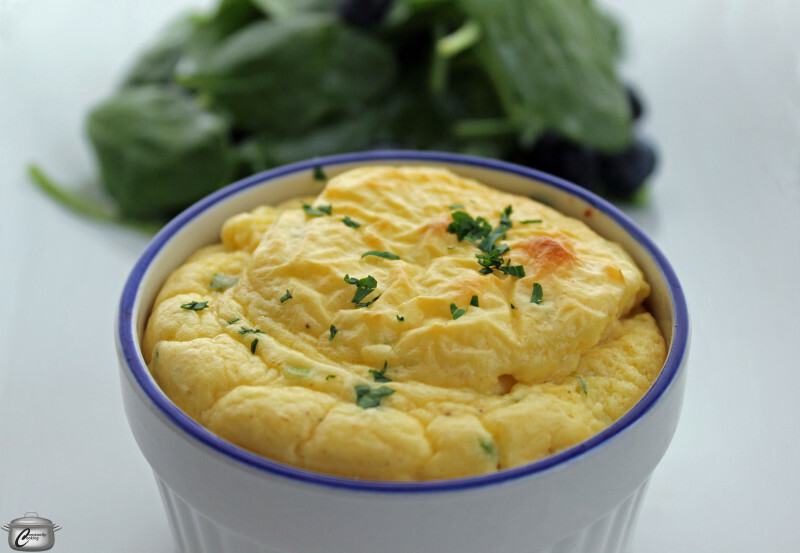 Light and fluffy yet full of flavour, cheese soufflés are surprisingly simple to prepare and make a great brunch or lunch. 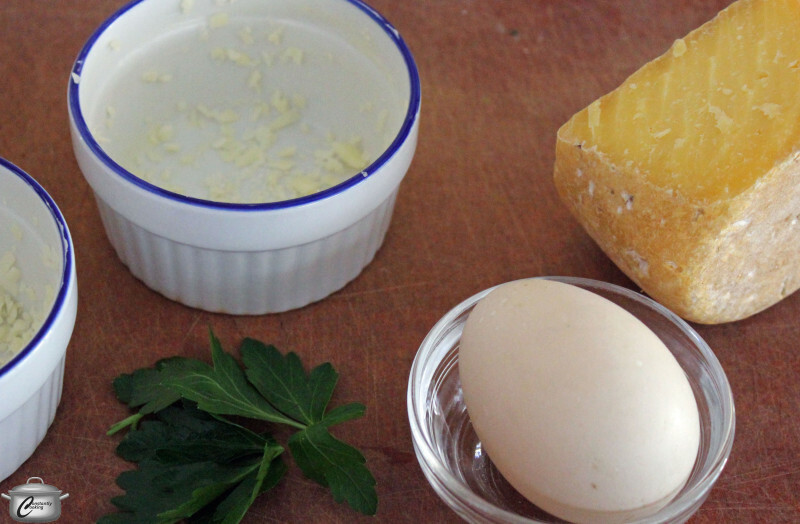 It only takes a few ingredients to make cheese soufflés – you probably have everything you need on hand! With the 1 teaspoon of butter, grease the inside (bottom and sides) of two 6 ounce (200 mL) ramekins. Sprinkle the 1 tablespoon of finely grated cheese inside the dishes, shaking to coat evenly. Melt the 2 tablespoons of butter in a small saucepan over medium heat. Add flour, paprika, cayenne, white pepper and nutmeg to the melted butter and stir to combine well. Cook, stirring, for 1 minute. Slowly whisk in milk and let the mixture simmer for a few minutes, whisking often, until it is smooth and thickened. Remove the pot from the heat and stir in the 1/3 cup grated cheese. Let mixture cool for 5 minutes, stirring often, then beat in egg yolk(s). Using an electric mixer, beat egg white(s) with cream of tartar until stiff peaks form (this takes about 4 minutes). Add the cheese, milk and egg yolk mixture to the whipped egg whites and whip until fully combined (about 20 seconds). Pour the batter into the prepared ramekins; there should be at least 1/2 inch (1.25 cm) of headspace. Bake for about 15 minutes, until tops have puffed up and are turning golden brown. You can test for doneness with an instant-read thermometer; the inside of the soufflés should be 170F. It’s fun to watch the soufflés puff up as they bake. This Farmers’ Feast recipe is by Paula Roy. A creative cook and innovative entertainer, Paula Roy has had a lifelong love affair with food and takes pleasure in showing others how easy it is to prepare healthy, appealing meals. She is always seeking new methods and inspiration and enjoys developing recipes for simple dishes packed with flavour. As a busy food journalist, Paula shares the delicious results of her culinary experiments and investigative research in Ottawa at Home magazine, where she serves as food editor. She also has a popular blog,www.constantlycooking.wordpress.com, is a food blogger at yummymummyclub.ca and makes frequent television appearances in Ottawa.